The ruckus around Indu Sarkar is uncalled for. How did political sentiments come into the making of cinema at all? We already have so many caveats for cinema — no hurting of religious, regional, caste, social & cultural sentiments. We must not add the bogey of political sentiment to all these. FREEDOM OF EXPRESSION? Director Madhur Bhandarkar’s (top) Indu Sarkar, on the Emergency, has stirred a hornet’s nest. FILM-MAKER Madhur Bhandarkar's forthcoming film, Indu Sarkar, set for release soon is in the eye of a controversy, apparently because it is a dramatised account of the Emergency imposed by Prime Minister Indira Gandhi in the mid-1970s. The Congress has kicked up a storm, claiming that the film has been made at the behest of the BJP, given director Madhur Bhandarkar's close affiliation with the party, with the express purpose of demonising Indira Gandhi and her son Sanjay Gandhi, in a bid to further vilify the Congress party. The publicity material, including the trailer, imagery, stills, the title Indu Sarkar gives one enough clues to believe that perhaps the Congress might be right and that Bhandarkar could be motivated to a certain extent in portraying the Gandhis in negative light. It is quite possible that the film might take liberties in exaggerating, misrepresenting, even blatantly denigrating the Congress party. However, the Congress has no business crying foul, demanding that the film be shown to them before release,putting pressure on the CBFC or even organising a stir against Indu Sarkar. That is because, like any other film-maker, Bhandarkar has every right to interpret events in the past, tweak them and use them selectively as a period backdrop, to tell a story which is fictionalised. The film is not a documentary, nor is it a biopic, so what basis does the Congress have to object to its release or force the film-maker to show them a preview? How is the demand any different or less illiberal than other recent attempts to scupper different films — be it the Rajput Karni Sena's attack on Sanjay Leela Bhansali's Padmavati, objecting to unconfirmed romantic sequences between Rani Padmini and Allauddin Khilji or lawyers approaching the courts to clip portions of Akshay Kumar's film Jolly LLB 2, because they felt it showed judges, courts and the legal fraternity in bad light? There is also news that CBFC has asked the film-maker to make 12 cuts, chopping of some words, scenes and references that might be construed as offensive to political sentiments of different organisations, including the Congress, the RSS and the Akalis. In fact, CBFC has now told a defiant Bhandarkar to take the matter to the Tribunal. Meanwhile, a woman claiming to be Sanjay Gandhi's secret daughter held a Press conference and claimed that the trailer of Indu Sarkar depicts her "father" wrongly. Interestingly, Sanjay Gandhi's official family, wife, Maneka Gandhi and son, Varun Gandhi, both of whom are part of the BJP don't appear to have said a word so far. Amidst all this, the real question is, why should the issue of political sentiments come into the making of cinema at all? We already have so many caveats when it comes to cinema — no hurting of religious, regional, caste, social and cultural sentiments. Are we now also going to add the bogey of “political sentiment” to it? Because if we are, then we are driving one more nail into the coffin of freedom of expression. For as we well know, just about anything can be politicised in our country. Moreover, the moment we accept the argument of hurting political sentiment, we immediately provide immunity to politicians, leaders and controversial political issues now and in the future, from ever being portrayed, dissected and criticised on screen. Instead of being blinded and whipping itself into a rage just because a film on the Emergency is being made by a film-maker with BJP leanings, the Congress needs to look at the larger picture. For a party that played a glorious role in India's freedom, ruled India for nearly 60 years and can rightly be credited for nurturing India's liberal democracy and many of its achievements, should it now start operating like an upstart political outfit, mimicking regressive, illiberal tendencies that are in vogue everywhere, because of the current dispensation in power? Can protesting a mere movie, be the agenda of a national party, just because it fears the movie is unkind or scathing towards its long-dead leaders? Does it really believe that a movie depicting events of 40 years ago could have such a decisive impact on public opinion that it will succeed in decimating the Congress party and its first family completely, across the country? If that is the anxiety driving the Congress, then it is not just an exaggerated fear, but also betrays insecurity and utter lack of confidence that does not behove a party that is supposed to be the principal Opposition. Of course, it's entirely possible the party is simply trying to galvanise its demoralised workers, using Indu Sarkar as a pretext. However, it would have been so much better if the Congress had refused to bite the bait, let the film be released without any protests and then pointed out flaws, factually wrong depictions or exaggerations resorted to by the film-maker, if any. This would have been a mature political response. Instead, by breathing fire it has accorded disproportionate attention and publicity to the film. It appears churlish, defensive and as undemocratic and intolerant as the BJP and its affiliates and clones. Indeed, if the Congress wants to regain its position as a credible centrist, progressive,liberal, democratic alternative, it cannot afford to be a mirror image of the BJP and its aggressive, right-wing, intolerant politics. It's high time it realised that being hypocritical and selectively liberal, won't help it to win back support from people who are uncomfortable with the BJP's authoritarian brand of politics. 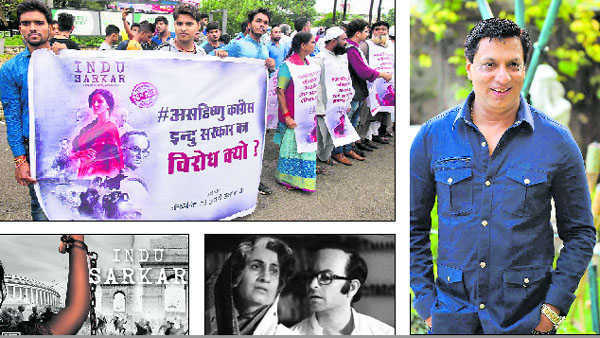 Above all, the Congress needs to see the sad, ground reality that their protest against Indu Sarkar simply does not resonate with today's middle class, which sees it as just another sycophantic action by the party. The writer is a Pune-based novelist and film-maker.